95 Gallon Severe Series L Shaped Aluminum Refueling Transfer Tank - John M. Ellsworth Co. Inc. Designed for severe conditions, these refueling tanks can easily handle larger pumps and off-road conditions. Your vehicle takes a beating in off-road environments and so does the equipment you're transporting. That's why we have developed the Severe Series tanks. The tanks are constructed using 50% thicker HD aluminum and have a unique internal pump bung support.Please make sure to measure your truck bed to verify the tank will fit based on the tank dimensions in the dimensions tab above. 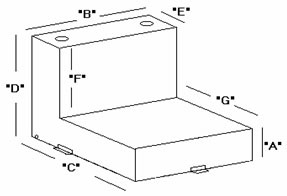 Also, please add an additional 1 ½” on the length dimension and width dimension to accommodate the size of the tank mounting tabs.